When I talk to friends and family about flying, their thoughts go to a miserable place of security checks, lines and just general frustration. Most feel that escaping the madness by visiting a lounge is like being welcomed into a peaceful gated community where the wine flows freely — a place they’ll never see. So, for all those who feel like my friends, let me tell you this: It doesn’t have to be that way! I get that sitting in the airport isn’t high on many people’s list of priorities. I’m certainly not a high roller nor do I carry elite status with an airline — well, technically Asiana Club Gold thanks to a crazy ANA business class fare — and I’m still able to access all kinds of lounges thanks to credit cards. Sure, you can get a Priority Pass Select membership if you have the Chase Sapphire Reserve® — the card of millennials — the Citi Prestige® Card, or other premium cards. Now, don’t get me wrong, these cards have some great benefits that I use regularly. But, if you want to give yourself the best range of lounge access with a credit card, The Platinum Card® from American Express is the way to go — The Business Platinum® Card from American Express provides the same lounge benefits. What lounges can you visit with the Amex Platinum? Unlike the Chase Sapphire Reserve and Citi Prestige — or your high-end airline co-branded card, the Amex Platinum takes a three-pronged approach to lounge access. Though keep in mind that sometimes these lounges are only available to you if you have a departing ticket for the same-day — arriving passengers might be denied access if the lounge is crowded. 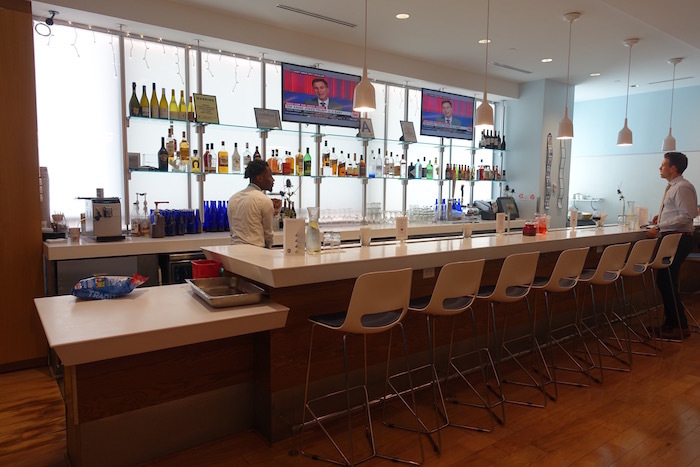 Amex put itself on the map with their Centurion Lounges as perhaps the best domestic lounge option in the U.S. In fact, they’ve become so popular that some are complaining of overcrowding. Personally, I’ve visited the Centurion Lounges in Dallas (DFW), Hong Kong (HKG), Las Vegas (LAS), Philadelphia (PHL), San Francisco (SFO) and Seattle (SEA). While the lounges at LAS and SFO were packed, I really enjoyed the lounges at PHL and HKG. In fact, the Centurion Lounge at HKG just might have the best bar in the airport. To access the lounge, you’ll want to have your Amex Platinum with you. If you happen to forget it when rushing out of the house at 4:45am to fly home for your grandmother’s memorial service — yes, this was me a few weeks ago, they will still let you in the lounge. You’ll just need to provide your social security number, birthdate and PIN. You can also bring two guests with you at no charge so you can move up the list of favorites among your friends and family. Heck, you can be a hero to someone you meet on your flight or in the TSA security line. You can also visit other American Express lounges in Delhi (DEL), Buenos Aires (EZE), Melbourne (MEL), Mexico City (MEX), Monterrey (MTY) — temporarily closed, Sydney (SYD) and Toluca (TLC). Not only that, but Priority Pass also has restaurant partnerships where they don’t have a lounge partnership. At each of these restaurants, you’ll have roughly the equivalent of $28 to spend. If you spend over $28, you just need to cover the remainder with your credit card. You can find restaurant partners in major airports such as Sydney (SYD) which has 9 spread across 3 terminals. Before you ask, I have not hopped from restaurant to restaurant… yet. Even some smaller airports like my hometown of Lexington (LEX) have partner restaurants. Make sure you remember to bring your Priority Pass card or have the digital card on your phone, which is accepted by many partners. One more thing about using the restaurant credit. Admittedly, this has become a pet cause of mine but please remember that the $28 credit does not include tip so please bring a little cash to tip — where it’s custom — if your total bill won’t exceed $28. The first time I saw a self-pouring beer machine was in a SkyClub at Tokyo-Narita (NRT) while connecting to Taipei (TPE). Changed my life. I still want one for my apartment. Now, you won’t find that kind of awesome at every SkyClub but you will find them at airports across the U.S. and some airports abroad. As with most domestic lounges, I’ve found SkyClubs to be hit or miss, but generally pretty good. If nothing else, they provide a chance to escape the noise, use the WiFi to catch up with friends or do some work and have a bite to eat and a drink. The biggest hurdle to accessing Delta SkyClubs as an Amex Platinum cardholder is that you must be flying on Delta. To be honest, though, this limitation really doesn’t bother me much. 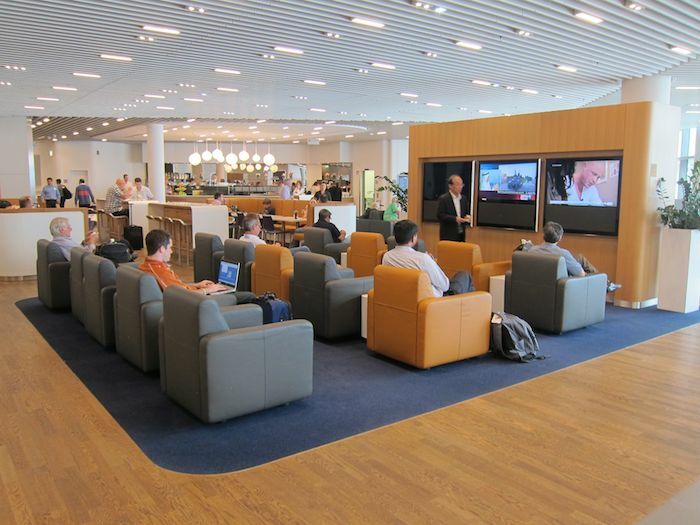 Unlike with Priority Pass partner lounges and Centurion Lounges, you will not be able to bring a guest at no charge. Similar to the Delta SkyClub access you receive with the Amex Platinum, access to Lufthansa Business Class and Senator lounges is restricted. You will need to be flying Lufthansa, SWISS or Austrian Airlines to have access. If you’re flying economy with one of these carriers, you’ll have access to business class lounges in Terminal 2 (Satellite Area) of Munich Airport (MUC) and Concourse B in Terminal 1 in Frankfurt Airport (FRA). If you’re flying business class, you can access the business class lounge but you’ll have access to the Senator Lounge in these same locations so you might as well take the upgrade. Currently, the Amex Platinum allows access through March 31, 2019. Personally, I hope they not only keep this option but expand it to other Lufthansa lounges as I have quite enjoyed this perk when flying through both Munich and Frankfurt. Airspace lounges might not be the most exciting as some food and drink options are not complimentary. However, it’s always nice to escape the hustle of the gate area for a little quiet, especially if you need to do some work. You’ll also be able to bring two guests with you at no extra charge — additional guests will incur a fee. On top of that, each person entering the lounge can receive a $10 credit towards food & drinks. Currently, you can find Airspace lounges at Cleveland (CLE), New York (JFK) Terminal 5 and San Diego (SAN). I actually visited the Stansted location last year before a flight to Dortmund (DTM) on Ryanair. The lounge was definitely the highlight of the travel that day. In fact, I was quite pleased with what the lounge had to offer. Honestly, I didn’t even expect to find a Priority Pass lounge at STN and only realized it existed when I check the Priority Pass app on a lark. The welcome bonus for the Amex Platinum can vary from the standard 60,000 Membership Rewards points with a $5,000 minimum spend to 100,000 Membership Rewards points with a $5,000 minimum spend. Some have had luck getting the higher offer using the Card Match Tool — I’m still waiting to be lucky. If you’re under 5/24 right now, you might consider holding off on this card and first getting the Chase Sapphire Reserve® or Chase Sapphire Preferred® Card to earn valuable Ultimate Rewards points before they’re not available to you. The welcome bonus for the Business Platinum often varies from a standard 75,000 Membership Rewards points with a $20,000 minimum spend to 100,000 Membership Rewards points with a $25,000 minimum spend. Sometimes American Express sends other targeted offers. Look, I’ve taken my fair share of flights without lounge access and I still enjoy traveling. However, I really do love a good lounge and absolutely love having access thanks to a credit card. As I often fly through airports with Centurion Lounges or SkyClubs in the U.S., the Amex Platinum is great for me. When I consider all my international travel, the Priority Pass Select membership makes it even better. Sure, I try to fly premium cabin on long-hauls, but when bopping around Europe or Asia on Ryanair or Bangkok Airways, Priority Pass is great. I even visited a solid lounge at Stansted (STN). That was a fun surprise. In the end, The Platinum Card® from American Express just provides a more complete package for lounge access. While the Chase Sapphire Reserve and Citi Prestige are great cards for other reasons, the Amex Platinum is the champ of lounge access. Which card do you find most useful for airport lounge access?